Thanks to my friend Britt Womelsdorf, I got the inspiration to write my last blog for the year and (try to) look forward towards 2019. So, let’s start. I would like to start with one of my personal highlights for 2018 – the SAP Cloud Platform Portal openSAP course (2018 Edition) with more than 7k enrolled learners. Here I would like to say a BIG Thank You to the team who ran the course and to the openSAP team, it is simply a pleasure working with you. Thank You! At TechEd Barcelona (and in Las-Vegas by my colleagues), we showed how SAP Cloud Platform and the Portal service can be used to build Employees Portals (or Digital Workplace, you name it) and simplify Supplier relations, from the onboarding process to the ongoing communication. By the way, both scenarios leverage the power of SAP Cloud Platform (Portal, mobile, workflow, inbox, etc.) and our eco-system with partners like Egnyte, LivePerson and Contentstack. We can’t conclude TechEd without THE highlight, the SAP Developer Garage and the amazing number of 10k+ missions completed at SAP TechEd Bangalore! Let’s now try to look forward towards 2019. You can looks at the SAP Portal (cloud and on-premise) roadmap, SAP Fiori launchpad (slides 31-34) and SAP Fiori Cloud (slides 36-38) roadmap and get a glimpse into what we are planning for 2019. Finally, continue providing guidelines and supporting customers to transition from the SAP Enterprise Portal to SAP Cloud Platform Portal (first wiki is already available, more is planned for 2019). Want to stay updated and keep in contact? I am so thankful that the community is reviving itself (thanks to the hard work of many people! ), so this is the best place to keep in contact and up-to-date. In addition, I highly recommend you to follow our community page, roadmaps (portal, SAP Fiori, SAP User Interface) and register to our portal newsletter. Thanks for all your great contributions this year Aviad! Happy New Year Aviad. I hope you do make it to Tech Ed Las Vegas 2019. Just to clarify, in the section entitled SAP Fiori Cloud for S/4HANA you say talk about the business content for S/4HANA 1709. Is the same content available for the 1809 release? Not yet, it is planned for Q1/2019. See the SAP Fiori roadmap (slide 38). Nice summary Aviad Rivlin and really looking forward to the first point in your 2019 highlights. Thanks for sharing this. 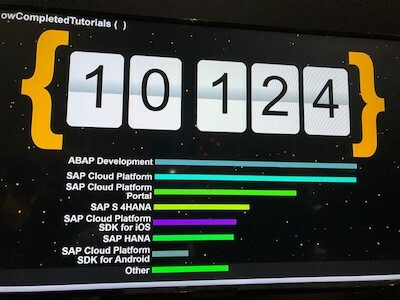 Will be really great to see the Portal service mature on SAP Cloud Foundry as I believe the demand from customers in this space will be ramping up this year. As for the wiki site – sure…just need to be guided on how to do this :-). Vera Gutbrod do you know if and how Phil can open a Wiki page in the community? Maybe on this page somewhere? 🙂 #FeatureRequestPhil is for sure one of our community gems. I don’t know if creating a wiki page is the most effective avenue, however. Recently we learned of a number of SAP Influence sites and although the areas they cover are not exhaustive, I know you opened a few feature requests there Phil, right? That provides upvoting and commenting activity as well. As a whole though we certainly could stand to do better with feature request functionality – not just channeling it in but also reporting back on where they go. Thanks for sticking with us to move the needle, Phil! Yes, agree with you Moya Watson – a specific general topic for SAP Cloud Platform would be the most appropriate me thinks along with the other SAP influence sites. Best to not have a separate place here. Yes – have opened a few feature requests and I have noted there is a feedback loop on this which is great. No problems – I’m all for making improvements in all areas where I feel I can add some value with feedback.